1. 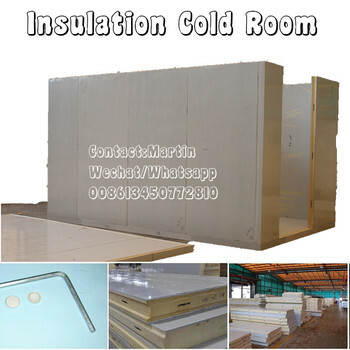 The cold storage room panel is durable in use, color lasting & coated layer keeping. density is up to 40kg/m3 or above. 4. The hinged door panel of our cold-room is made by heavy duty door hinge, heavy duty door lock and hydraulic door closer. tight connection and sealing of the cold room. Length (m) *Width (m)*Height (m) According to client's requirement . hinge door, convex door, sliding door. 1)Panel:polyurethane panels are of 100% polyurethane insulation foamed by high pressure, density about 43kg/m3,with flame retardant.The panels are convex(male)and concave(female) type,with cam locks preburried inside the panels,use hexagonal key assemble and disassemble. 2)Steel sheet cover: painted galvanized steel steel, we also have stucco embossed aluminum, stainless steel,and PVC stell.